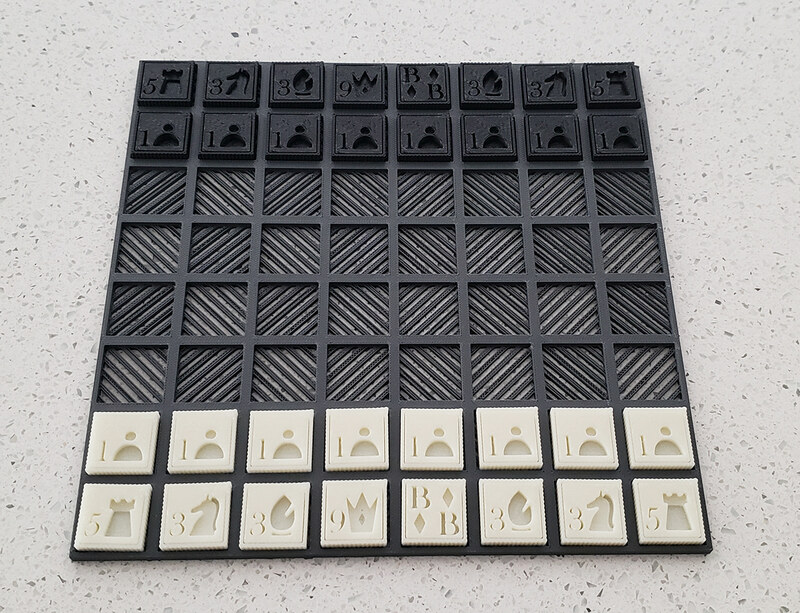 As a gift for my father to commemorate his retirement, I designed and 3D printed a chess set for him. My father is an avid chess player as well as a dedicated philatelist, so I thought it would be fun to combine two of his passions by making the set pieces look like postage stamps. 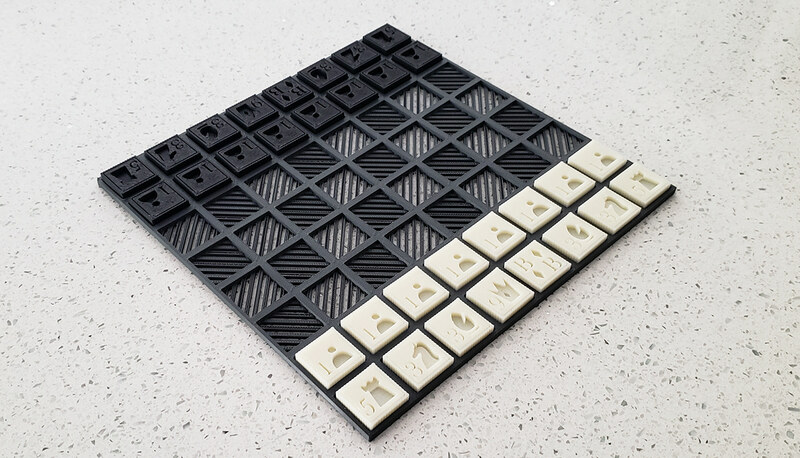 The result is a board approximately 9" x 9" with easy-to-use pieces in a minimalist style. The board was designed so that it could be printed as a single part. Instead of having different colored squares for the rank and files, diagonal slats are laid out in an alternating pattern. 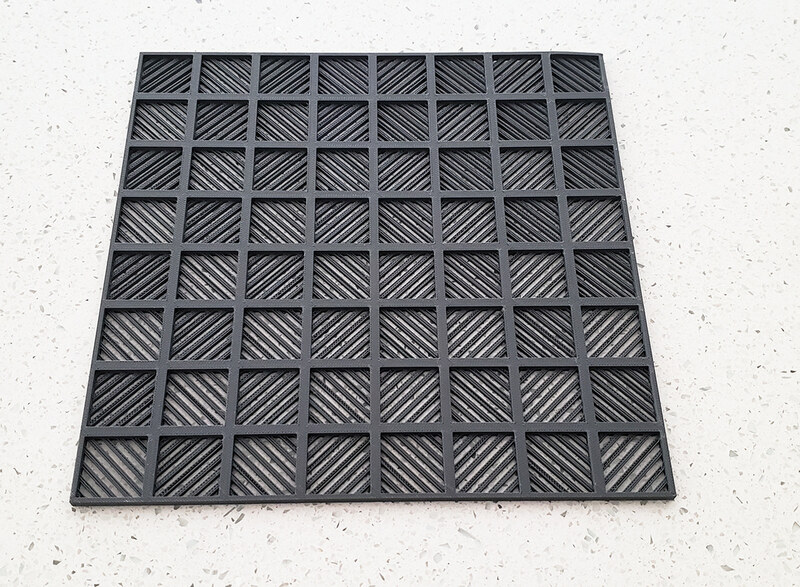 The space between slats is embossed so that pieces fit within a square rather than sitting on a singular flat surface, ensuring none are misplaced. The piece set is designed to reflect postage stamps in a few ways. The outer edge of each piece has ridges that mimic stamp perforations, which has the added benefit of providing extra grip to the player. A large number on each piece mimics a stamp's cent value and additionally indicates the relative piece value of the pawn, bishop, knight, rook, or queen. As the king has no relative piece value, I have instead designed it to have my father's initials, as it was a gift after all. Lastly, the size of each piece is similar to that of an actual postage stamp, which coincidentally is a good size for a chess set. The pieces were designed in a minimalist manner to ensure a higher quality of accuracy when printed. To add depth, each piece has two levels of relief, as seen in the mane of the knight's horse versus its body. The white set is printed in a semi-translucent material, which when held up to the light further indicates the two relief levels. The chess pieces in the set are flat, which gives them the added benefit of also functioning as checker pieces on the board. It was a fun process designing a board for my father and he loved it as a gift, which made the effort worthwhile. It was also a good learning experience for getting more familiar with 3D printing and understanding how to maximize the quality of each product. 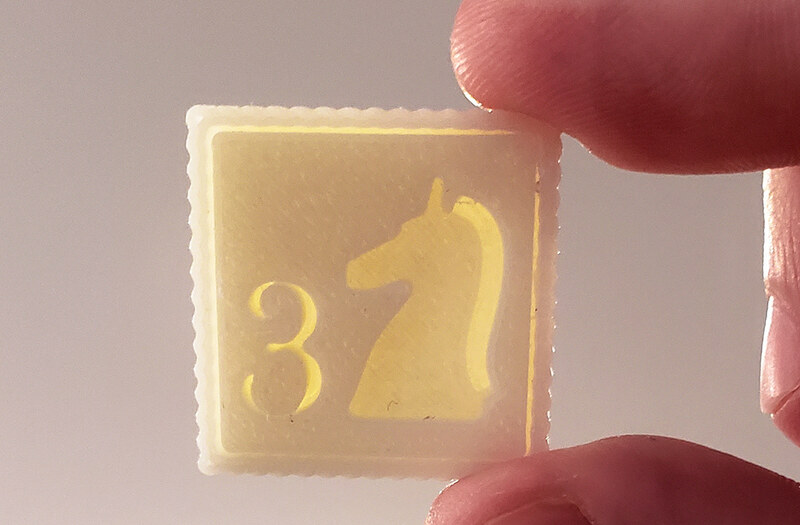 3D printed chess set with a postage stamp theme. Designed as a gift for my father.